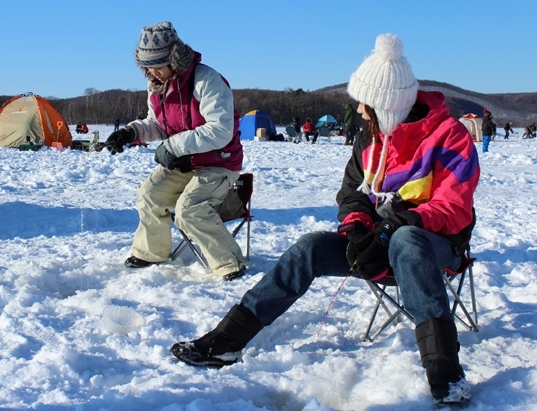 Smelt Ice Fishing at Lake Abashiri - includes Tempura cooking onsite! When the lake is frozen, it is time for ice fishing! This program is ideal for beginners, as it is a guided course including the tent and tempura cooking at the end. Program duration is 100 minutes, but it may be as long as 2 hours if you like it and the condition is right and comfortable. This was one of our favorite family activities in Japan this winter! The kids had fun catching fish and the tempura was delicious. The tour guide, Kanako Umebayashi, helped with arrangements to make sure we could get to our next destination on time. Both of the guides have interesting information and helped us be successful in catching a lot of fish. Everything is provided! Thank you for a fun time!